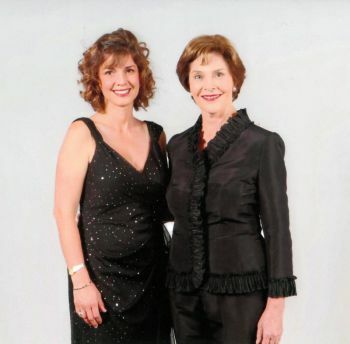 Dr. Laura had the opportunity to meet former First Lady Laura Bush at this year’s Hinman Dental Convention. The Hinman is an educational event, held every March in Atlanta. There are many courses and exhibitions at this convention, and it is an annual event for our office. We close the office for 2 days, and all of us travel downtown for classes, camaraderie and to learn about new products and technology. Drs.Laura and Merrick both are members of the Hinman Dental Society. It is a Society focused on providing continuing education to dentists and their team members and promoting high practice standards. The annual convention is attended by over 20,000 people, from all over the world. One of the responsibilities of membership, the doctors both volunteer their time during the convention – they have hosted speakers, registered and guided attendees to class, helped out with participation courses and been a part of the entertaining Keynote session. The Keynote session is the opening ceremony of the Hinman convention. During this time, the course clinicians are introduced and honored, the history of the Hinman Dental Society is recounted and we hear an update from the national American Dental Association about the current state of dentistry. There is also a featured Keynote speaker every year. This particular year, it was Mrs. Laura Bush. She was an amazing speaker – very engaging and humorous. She shared about her time in the White House, stories of her children and husband, and details about her current projects and hobbies. She met with Hinman members before her speech for photos and conversation. Dr. Laura had to admit – she was a little starstruck!